Australia is the only country in the world which covers a whole continent, every other continent has more than one country. It is the only country that is also a continent, and the only continent that is also a country. It is the sixth largest country in the world with a total area of 7,686,850 sq km (2,967,909 sq. MI), making it slightly smaller than the contiguous 48 states of the United States and 31.5 times larger than the United Kingdom. The photo is of olgas in Northern Territory of Australia. Australia is the only country in the world which covers a whole continent, every other continent has more than one country. It is the only country that is also a continent, and the only continent that is also a country. It is the sixth largest country in the world with a total area of 7,686,850 sq km (2,967,909 sq. MI), making it slightly smaller than the contiguous 48 states of the United States and 31.5 times larger than the United Kingdom. 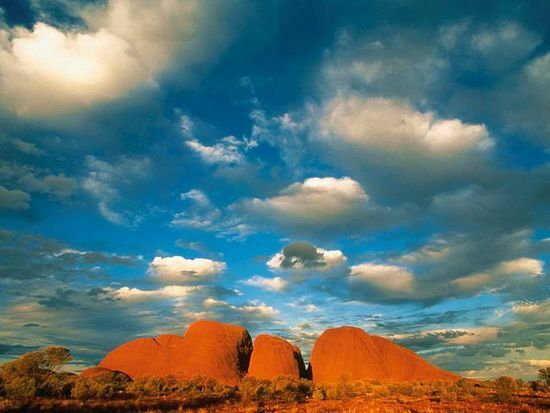 The photo is of olgas in Northern Territory of Australia.